Shipping of hazardous chemicals has to be managed closely to ensure that both chemicals and their containers can be effectively tracked to minimise any loss of the assets and monitor all legal container compliance requirements. 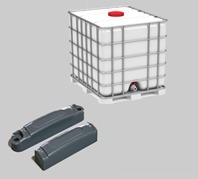 The Intermediate Bulk Containers (IBC’s) and pump over pressure bins used by Industrial Chemicals to deliver their products represent valuable assets which the company needs to monitor closely. Industrial Chemicals Group Ltd uses IBC’s to move chemicals between its six UK manufacturing plants and many customer sites. Control of the IBC’s used to transport bleaches, acids and other chemical products needed to be made more efficient. Industrial Chemicals saw that electronic tagging of IBC’s could provide them with the traceability they needed and could help to reduce the costs of lost and damaged IBC’s. They chose CoreRFID to work with them on the selection and supply of the correct RFID technology and develop a tailored, user friendly solution for their asset management needs. 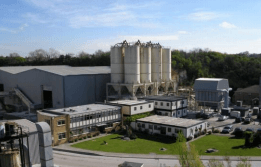 Industrial Chemicals Group has grown over the past 40 years from a company with just one vehicle to today when it operates six manufacturing sites in the UK and one in the USA, employing over 400 staff and handling over a million tonnes of materials each year. Industrial Chemicals delivers over 300,000 tonnes of products to customers in the detergent, paper, water treatment and chemical industries worldwide. Handling hazardous materials has meant that Industrial Chemicals has needed to manage its operations in line with standards such as the UK’s Pollution Prevention and Control Regulations and the Control of Major Accident Hazard Regulations. Their West Thurrock site was one of the first to be granted a UK Pollution Prevention and Control permit. Industrial Chemicals have traditionally supplied chemicals in bulk using the company’s own fleet of tanker vehicles but have recently entered the packaged chemicals market delivering product in IBC’s, pump over pressure bins and other small containers. IBC’s have a metal frame with a re-usable tank able to contain up to 1000 litres of product, Industrial Chemicals has over 3000 IBC’s representing an asset value over £400,000. IBC’s are delivered to customer premises where the product will be consumed and then the IBC collected by the company for reuse. The IBC’s need to be tracked into and out of company premises and monitored to know where the assets are located at any time, how long the assets have been at customer premises, record any damage assets on return and monitor IBC’s service status and service life. Manual tracking of IBC’s, logging delivery points and checking stocks regularly, was not effective and extremely time consuming. The packaged chemicals division is a fast growing area of the business and Industrial Chemicals wanted to implement a tracking and monitoring solution that could grow with the development of the business and offer maximum control over these moving assets. “RFID gives us a way of keeping track of IBC’s across our own locations and customer sites. CoreRFID has helped us to realise a full asset management solution which greatly improves our accountability and overall management of our container fleet.” – Darren Sharpe, Energy Projects Manager, Industrial Chemicals Group Ltd. The system used by Industrial Chemicals to track their IBC’s uses electronic radio frequency identification (RFID) tags. Operating in the UHF band these tags can provide a way of identifying the IBC to which they are attached. The tags can be read from a distance of up to 3 metres. CoreRFID helped Industrial Chemicals to select the most appropriate tags and reading equipment. CoreRFID also developed (and now host and operate) an application to track IBC’s to the location where they were last checked and to control IBC’s that can only be re-used a specified number of times. Intermediate Bulk Container and the RFID tags used to track it. The tags for the Industrial Chemicals solution were selected for their ruggedness and suitability for use in an industrial logistics application as well as providing reading characteristics that allowed them to be easily detected and read out. The selected tag (the Omni-ID Exo 600) was designed for use in a wide temperature range and to provide IP-68 and MIL standard 810-F protection to the tag. It has a small footprint to allow it to be attached to the metal frame carriers of the IBC’s. The device used to read tags is a compact, robust, handheld computer (the ATiD AB700) which is a Windows Mobile compatible computer that is able to read RFID tags and bar-code labels. The handheld has a camera and a wide range of communication options, CoreRFID has found it a flexible and reliable option in many logistics and asset related applications. A software application running on an ATiD AB700 handheld computer / RFID reader is used to record in and out IBC movements from company premises and to carry out internal and external stock-takes. If an IBC is seen to be damaged on return, a photograph can be taken using the ATiD AB700’s 3 mega-pixel camera and can be linked with the IBC check-in record. The application used is one of a number of similar Windows Mobile software solutions developed by CoreRFID. The application focus is on simplicity of operation with a minimum of data entry and menu choices needed to achieve the required result. At the end of each day, or whenever needed, data can be up-loaded to a database operated by CoreRFID on behalf of Industrial Chemicals. Access to this database provides Industrial Chemicals with an easy way to determine which IBC’s are where and what their usage history has been. They can also identify IBC’s that are approaching the end of their operational life and data from the system can be easily downloaded for additional analysis.